This Friday was my last day working at Piccadilly Circus, so we went for a sit-down lunch, rather than just popping to Whole Foods. We ended up in a French cafe called Le Pain Quotidien on Wardour Street. It turns out it’s quite expensive, for what is essentially a jumped-up sandwich shop. I cannot fault the quality of the food, but I can certainly fault the pricing. When you can get a whole bloomin’ calzone for a fiver in Whole Foods, it seems a bit bizarre that you can pay upwards of £10 for an open sandwich. It was delicious, but that’s not the point. So, what do we have here? 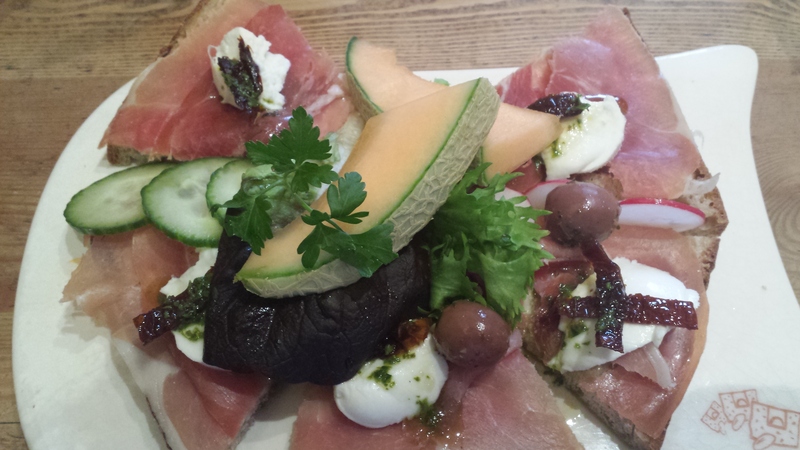 Parma Ham, buffalo mozzarella, sundried tomatoes, olives and melon, with a single salad leaf. Classic combo, lovely meal – just not worth £10. My colleagues had similar variations (ham, cheese and mustard; chicken and chorizo etc), but we were put back a bit by the price, especially as the suggested tip is incorporated into the price, and you don’t actually get the option of not paying it. Ho hum. Good food, fairly good service, very overpriced. But was it organic Chris? In Australian markets, we pay 2-3 times as much for organic produce. (don’t know about restaurants or cafes – I usually can’t afford them because I spent all my money at organic fresh food stalls at the local market). I’m not sure about organic. It wouldn’t surprise me, that does tend to push the price up. I’m inclined to say that it’s just London prices, but as you’ll see from a post I’m publishing tomorrow London doesn’t always mean expensive!